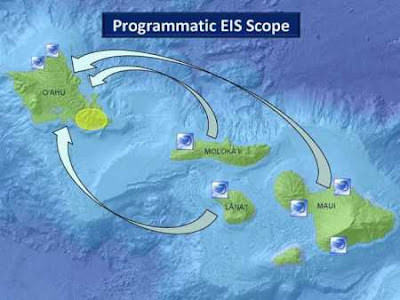 State and federal officials are holding public meetings starting tomorrow on an environmental study of the proposed transmission of wind energy from Maui County to Oahu by undersea cable. Star-Advertiser. The National Weather Service in Honolulu has issued a High Surf Warning, effective from midnight Sunday night until 6 a.m. Tuesday for the north and west facing shores of Kauai and Niihau and for the north facing shores of Oahu, Molokai and Maui. Hawaii News Now. Collecting reef fish for sale in the aquarium trade would be banned or restricted statewide under bills introduced by Maui legislators. Maui News. Bills proposed by Maui lawmakers would set bag limits and size restrictions for uhu and goatfish caught in waters off Maui. Maui News. A measure creating a school board directly appointed by the governor is heading for a vote in the full Senate. KHON2. With gas consumption projected to decrease in coming years, lawmakers are looking for a new way to pay for roads — taxing drivers based on their mileage. Civil Beat. A self-storage entrepreneur is protecting more than 2,000 acres of Hawaii agricultural land from development. Associated Press. The first chartered direct flight full of high-spending Chinese tourists touched down at Honolulu Airport yesterday with 263 passengers eager to shop and see the islands through the Chinese New Year over the next six days. Star-Advertiser. A China Eastern Airlines A-340 touched down at Honolulu International Airport at 11:30 a.m. Sunday, becoming the first-ever direct charter flight from China to Hawaii. Hawaii News Now. Hawaii tourism officials and politicians greeted the first direct charter flight from China Sunday. KITV4. The state and a private contractor are installing extensive new security and surveillance measures at harbors and shorelines that include planned use of unmanned aerial drones, according to public records. Hawaii Reporter. Wright: The U.S. is making a killing off the killing in Afghanistan. Hawaii Independent. The U.S. Army is taking responsibility for "miscommunication" it said fueled the recent public outcry over its proposal to conduct high-altitude helicopter training on Mauna Kea and Mauna Loa. Tribune-Herald. Over the past decade, the state has installed air conditioning in just three schools. Star-Advertiser. As part of a push to extend services to more native Hawaiian children statewide, Kamehameha Schools spent $102 million on educational outreach programs last fiscal year, up from $57 million in 2006. Star-Advertiser. The state is due to hold a public hearing this week on efforts to avoid and minimize harm to nene and other endangered birds during the planned construction of a new development at Kauai Lagoons Resort in Lihue. KHON2. A state agency collaborating with a community advisory council has sketched its vision for developing state land in Kakaako next to Kewalo Basin. That was no easy task, but now comes the hard part: paying for delivery. Star-Advertiser. First-ever State of the County addresses Mayor Billy Kenoi delivered have drawn mixed reactions from County Council members, several of whom wanted a budget forecast. Tribune-Herald. The Hawaii County Council will get its first look at a redistricting plan Tuesday, when a bill by South Kona Councilwoman Brenda Ford is scheduled to be heard by the Committee on Governmental Relations. West Hawaii Today. Every year researchers and scientists send thousands of island bugs to the University of Hawaii’s insect museum. Hawaii Public Radio. Molokai Dialysis Facility is preparing to upgrade their facilities to better suit special case patients, so they’ll no longer need to travel off-island for dialysis treatments.Molokai Dispatch. Watching a whale breach off Ahukini Landing was the perfect way to wake up Saturday, said Lani Broadbent, part-time resident of Wailua and Maryland. Garden Island.